It can be super easy to focus on our flaws, am I right? You get a little confidence going and before you know it, the little gremlins come out and are all like, “Who do you think you are?! You should be less [fill in the blank] or more [fill in the blank].” So today, I want to take a moment in celebration of things I love about myself. 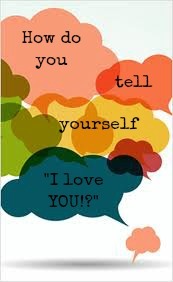 I hope that you will share a few things you love about yourself with me in the comments section below. # 10- That I am not afraid to try new things whether that is to travel someplace new, tackle a new recipe, or a new form of exercise. #9- That when I love, I love with my whole heart. I’m all in, baby! Let’s get vulnerable! #8- My sense of humor. I love a good laugh--clean or dirty! Laughter is contagious and it’s great medicine for my soul....and it doesn’t take much to get me on a roll. #7- My ability to be open with others. I love that I am not afraid to share my emotions or what is on my mind with other people....I am grateful because it allows me to connect with the people around me. #6- That I can admit I need some work. In the past year or so, I have been recovering from perfectionism...I need some work, but I can admit that and it feels GREAT! #5- My healthy body image. Loving my body hasn’t always been easy for me, (remember my dressing room melt down?!) but cultivating a healthy body image has been worth it. Worth. It. #4- That I am hardworking. Type A, I think they call that? Haha. Really though, I enjoy the fruits of my labor and I couldn’t get there without the hard work. It feels good and I value that aspect of my personality. #3- My beauty marks. This is esthetic, I know, but I love them, especially the one by my lips. Not too big, not too small...and don’t even TRY to call it a mole. It’s a beauty mark. #2- That I write letters. You know, with pens and paper. This is one thing I enjoy doing and I love this about me. It’s wonderful to hold a letter someone wrote in your hand and I love telling people I love them this way. #1- My compassion, which is always evolving. Compassion is a journey--a life’s work--and I am happy that I have an evolving understanding of it. I am always striving for a deeper sense of compassion, but I happy that I have gotten to this point with it. I have been going through your blog for a while. The kind of resources you have amassed is really praiseworthy. It certainly shows the kind of passion you have for this topic. I would love to see it updated more frequently. Carry on the good work.